Great idea Sihx! Now I have something to do for the next week and a half in-game to get ready! Did you end up dual boxing before MoP dropped? Sounds like a good idea. Just got one question though. Are you just going to put your second Mage on follow the whole time? I tried dual boxing in cata and just had one toon follow the other but every few minutes it would go afk, which got annoying. Any tips? I know this is 2 1/2 months late, but no, I didn’t just put my mage on follow. I used Jamba to broadcast my keystrokes to my second WoW client. For example, my mage was on autofollow, but would auto-assist the main mage’s target and duplicate the spell. So, I could almost always one-shot a mob when I opened up with a double pyroblast from both mages. Even afteward I could just mop up with a double fireball or ice lance. 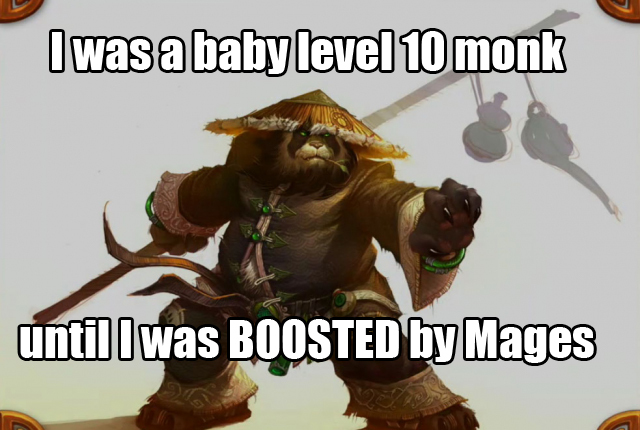 I sped through and boosted all my alts to 80/40/30 in no time, and boosted my new panda monk to 80 with the granted levels! Thanks for the reply. I did some research after I posted that and came up with something similar. Works fairly well.